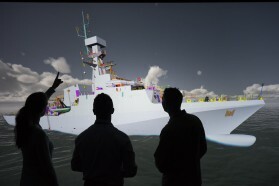 Engineers at BAE Systems are modernising their approach the design and technology of how they build Royal Navy warships by using virtual reality technology. BAE has constructed a network of visualisation suites at its sites in Glasgow, Portsmouth and Bristol, which create full scale 3D ship prototypes, enabling engineering teams to virtually build and test the design of vessels in advance of the first steel being cut. A laser tracking system and interactive wand allows operators to create images and inspect a ship’s design from any angle, giving them the ability to examine specific areas, equipment and systems, quickly and easily. This technology means potential engineering issues can be identified and addressed in real time, while the new systems also enable greater collaboration and engagement with suppliers and customers, bringing them into the design process at an earlier stage. Mick Ord, managing director at BAE Systems naval ships business, said: “Visualisation technology is transforming the way we design, build and deliver complex warships. By creating a virtual prototype, we can mature and optimise a ship’s design and gain a real understanding of the vessel and the experience of those serving on board before manufacturing begins. BAE Systems new visualisation suite. Cheshire-based SME Virtalis was awarded the contract to install the virtual reality technology across the company’s sites. A pilot has been underway since February and the company has since opened five suites which have played a key role in the design of the Royal Navy’s new offshore patrol vessels. These teams also use the tool to further advance the design of the Type 26 global combat ship.